Public Service Mutuals: An Effective Partnership or Political Challenge? 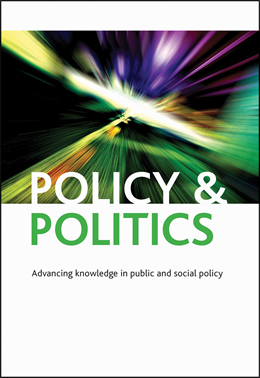 Richard Hazenberg and Kelly Hall discuss their recent article in Policy & Politics, Public service mutuals: towards a theoretical understanding of the spin-out process. Over the last few decades, successive UK governments have encouraged the transfer of local authority staff into new employee-owned mutual organisations (also known as ‘spin-outs’). These spin-outs often take the organisational form of social enterprises that continue to deliver public services, but as self-reliant and independent organisations. Policy-makers are hoping that by encouraging public sector workers to be more entrepreneurial, public services can become more innovative, efficient and responsive to the needs of those who use them. The ultimate aim of this policy is to improve services at the same time as making savings to the public purse. Spin-outs however, operate in quite a volatile political and economic environment. They are required to compete in the marketplace with other public, private and third sector organisations for contracts to deliver services. This competition leads to them having to engage and collaborate with a multitude of stakeholders, either informally (e.g. with service-users and staff) or contractually (e.g. with the parent public sector authority or a private sector consultancy firm). These collaborative relationships can exert significant pressure on spin-outs and either help or hinder them in their drive for efficiency, effectiveness and sustainability. For instance, whilst Local Authority budgetary cuts and redundancies can trigger staff to spin-out into a social enterprise (as a way in which to maintain their service and jobs), those spin-outs that do not have the full support of senior management teams, other staff and service-users are unlikely to be successful. Our article in Policy and Politics identifies and maps the complex partnership arrangements used in a spin-out involving multi-stakeholder collaborations with staff, services users, and public, private and third sector organisations. In doing so, we attempt to develop and refine our theoretical understanding of spin-outs by drawing on partnership theory and combining this with prior research on policy-windows. In providing this dual theoretical approach we demonstrate how the spinning-out process for public services is shaped by both exogenous factors (e.g. recessions, globalisation, institutions and ideology) and stakeholder relationships. Additionally, we also identify that the interplay between these factors is in a constant state of flux. Within this arena of exogenous factors and multiple stakeholders is the social entrepreneur, who acts as a catalyst for the spinning-out process and also as an arbiter between competing interests. The article therefore demonstrates the importance of the social entrepreneur in delivering innovation in public service delivery, as well as providing much needed evidence on the effectiveness, longevity and governance of spin-outs. The findings presented provide invaluable learning opportunities for any local authorities or policy-makers that are seeking to ‘spin-out’ public services. Indeed, at a time of significant public expenditure reductions Local Authorities are seeking to find new, innovative ways to reduce spending whilst maintaining services. For many, the option of ‘spinning-out’ is the only alternative to traditional service tendering or even decommissioning. However, the process of ‘spinning-out’ is time consuming, difficult and can be costly if the processes, relevant stakeholders and motivations for action are not clearly understood. This article seeks to provide an overview of the process that can assist the transition of public services into mutuals and social enterprises. Dr Richard Hazenberg is Social Enterprise Researcher for Impact and Value at the University of Northampton. Dr Kelly Hall is a Lecturer in Social Policy based in the Institute of Applied Social Studies at the University of Birmingham. She is also the co-ordinator for the Postgraduate Policy into Practice programme.